In a large bowl, beat the egg, blend in the mayo, mustard, Old Bay celery, Worcestershire, peppers and onion. MRS. FRIDAY’S® BREADED KRABBYCAKES® JUNIOR 1.5 OZ. 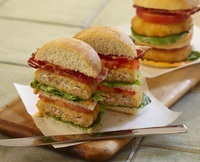 MRS. FRIDAY’S® BREADED KRABBYCAKES® 3 OZ.